Hello, congrats on making it to part 3 of my bull case on MBT. Even though MBT has proved to be a great company so far, I decided to test MBT based on the 6 ratios below to further analyze if it is really a company that can survive the current Russian economic crisis. It will be done by comparing it to Vimpelcom (NASDAQ: VIP), Verizon (NYSE: VZ), and AT&T (NYSE: T). Why use these companies to compare? It’s because VIP is MBT’s fiercest competitor in Russian region and VZ and T-because they are one of the best telecommunications company in the world. Working capital is negative when a company’s current assets are less than its current liabilities. Negative working capital can sometimes be good – these companies collected as much money as possible in advance from customers (counted as current liabilities) and holding out on paying others – Telecommunications Company stood out among the rest of the industry in doing this – First, the sector does not require raw material. Second, most of the capital requirements for the license fee, spectrum cost, tower installation cost, etc, are taken care of at the initial stage. Finally, these companies collect money from prepaid customers in advance, and from postpaid customers, without much delay. This is a sign of managerial efficiency helped by the nature of the business- as they are able to use the cash they receive in advance to pay their accounts payable – rather than keeping large cash balance on hand to pay account receivables. However, having a positive ratio would be good for a telecommunications company in times of turbulence – so that in worst case scenario, they would not have to sell their fixed assets to meet current liabilities. Conclusion: For the scenario in Russia, MBT is better positioned as compared to VIP in terms of ability to repay short-term liabilities without having to sell fixed assets. 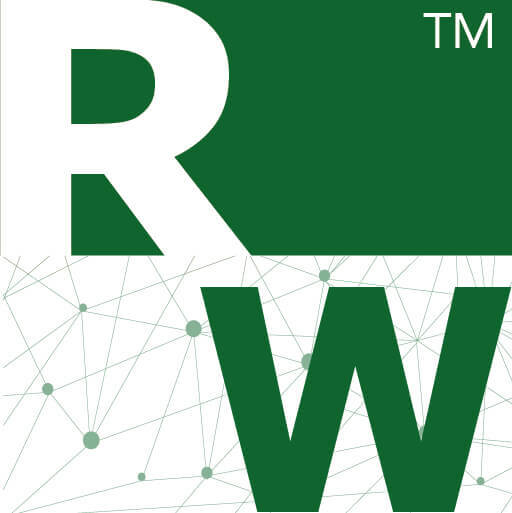 Retained earnings are the earnings not paid out as dividend – instead reinvested in its core business, or to pay the debt. Traditionally, a younger firm tends to retain less because their earnings are not sustainable yet and they tend to also have a low retained earning/total assets ratio. Conclusion: MBT has the highest ratio of retained earnings/total assets. 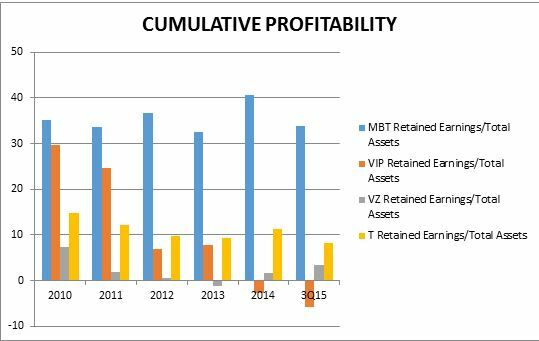 This means that over time, comparing them with the other companies, MBT is the most consistently profitable company in effectively using its total assets- as it is able to retain more- as a percentage of total assets. 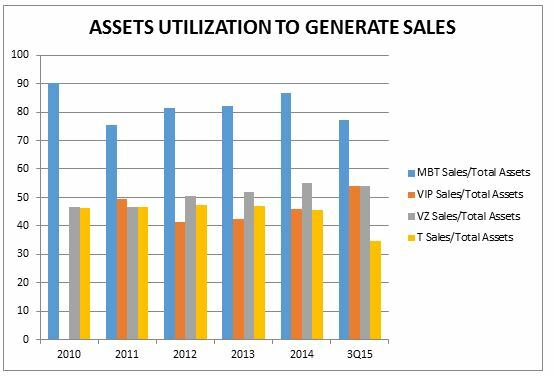 It is evident that MBT is a well-managed company who is really good at utilizing their assets to generate sales based on the percentages shown on the above chart – in comparison to VIP, VZ, and T.
Sales/total assets ratio is not good enough to see whether these companies can really utilize their assets well to make a profit without incurring too much debt. Hence, let’s take a look at the EBIT/Total assets ratio to see if these companies truly can manage their costs well. As you can see, for 3Q15, although VIP has a positive Sales/Total Assets ratio percentage of more than 50%, it has a negative EBIT/Total Assets percentage of close to -2%; this means that it is losing money. In comparison, MBT has again done admirably – it has the highest assets utilization rate in generating earnings among the other three companies! -A Larger value can mean a decline in firm’s assets relative to its liabilities and indicates unhealthiness. MBT and VIP is not able to raise equity financing through newly issued depositary receipts such as the ADR, due to Russia securities regulations providing that no more than 25% of a Russian company’s shares may be circulated abroad through sponsored depositary receipt programs; One of the reason why they MBT and VIP have a relatively high amount of debt to equity ratio – albeit not as bad for MBT as compared to VIP. 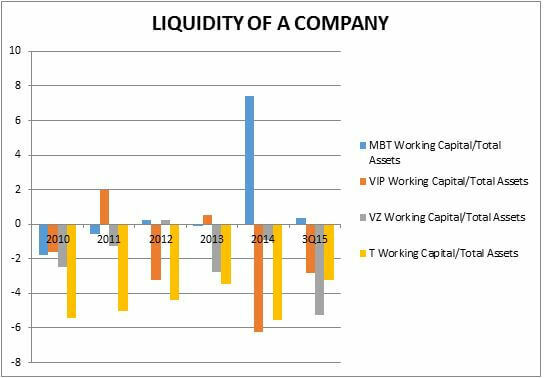 Even in comparison with VZ and T, MBT does not fare too bad at all – seems like it is common for telecommunications company – even one of the best in the world to have a relatively high debt to equity ratio of more than 0.5. Winner: All except for VIP as it has too high of a debt/equity ratio and it may lead to bankruptcy if they are not able to promptly pay their interest payments or able to refinance their capital. 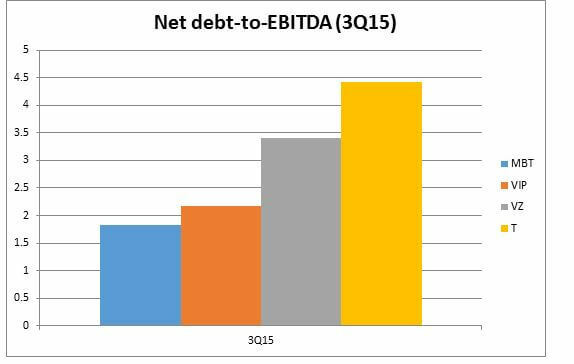 On top of that, I analyzed these companies latest Net Debt to EBITDA for 3Q15 – to look at their capacity to repay their debt. 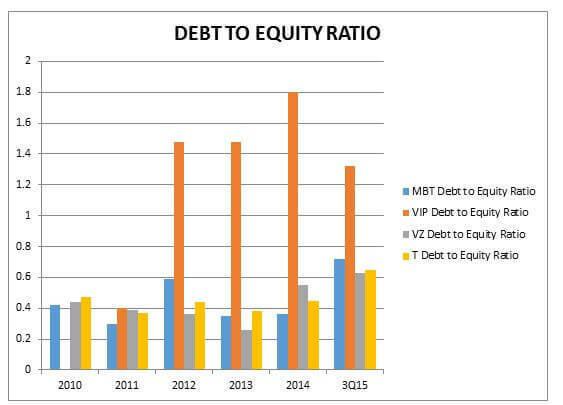 As you can see from the above graph, MBT had the best debt repayment capacity as compared to the VIP, VZ, and T at the end of 3Q15. First of all, I would like to say that It is unrealistic to expect or demand absolute certainty in valuation, since even for discounted cash flows valuation, cash flows and discount rates are estimated. For this article, I will use a simple method of valuation which many of you might or might not agree on- Relative Valuation (Estimates the value of an asset by looking at the pricing of comparable assets relative to a common variable such as earnings, cash flows, book value, or sales). Investors often use different metrics to determine telecom companies’ relative valuation – PE (price-to-earnings), price-to-free cash flow, EV/EBITDA (enterprise value to earnings before interest, tax, depreciation, and amortization), and price-to-cash flow. As telecom is a capital-intensive industry with high fixed cost and they often finance their capital expenditure with debt, price to free cash flow or price to earnings ratio without being normalized is not reliable – their earnings and free cash flow will be volatile year on year due to the high financing cost and depreciation expense. Hence, for a simple valuation purpose, I shall use EV/EBITA – better to evaluate the profit performance of companies with large capital expenses (as it removes the effects of capital expenditures completely). 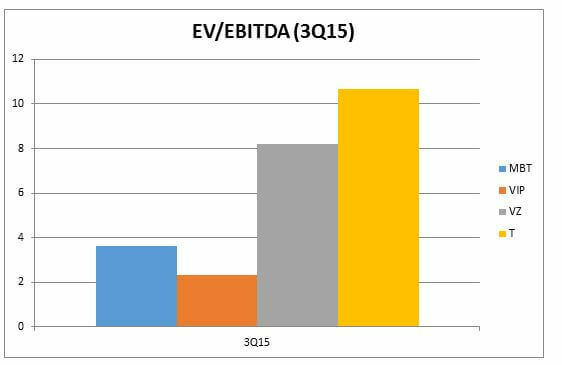 This is essentially a relative valuation based on earnings from comparable companies. This is essentially a relative valuation based on comparing earnings from comparable companies. 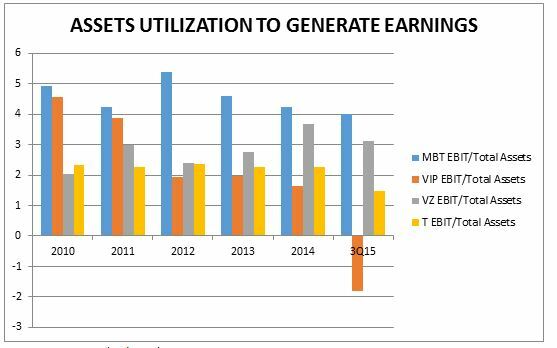 Both MBT and VIP are obviously undervalued as compared to VZ and T – due to the economic uncertainty in Russia. However the question is between MBT and VIP, which one is better? MBT is still a better choice due to a better profitability and better debt repayment ability – especially important in the current Russian economic crisis. Telecom is a defensive industry – mainly bought for the stable cash flows and dividends throughout the ups and downs of the business cycle. The key to a turnaround is the rise in the price of oil which will lead to a Ruble recovery. This is because the Russian federal budget is dependent on hydrocarbon taxes for 50% of its revenue. And with the recent OPEC countries still not willing to firmly cut the supply of oil and have not shown any of such actions, I predict it will not happen anytime soon- maybe in the period of 3-4 years. Having said that, the price of oil cannot go to zero as it is a commodity and there are costs to produce it. As it goes lower, there will be more oil related companies declaring bankrupt because they cannot remain profitable. When that happens, it will only be a matter of time before production starts falling and the price of oil start increasing again due to the drop in supply. 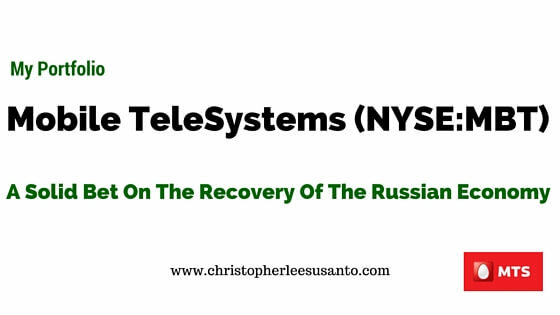 As a telecommunications company, MBT is a solid bet on the recovery of the Russian economy. The Russian telecom industry has not matured yet because there is still growth potential in terms of internet penetration rate. MBT certainly has the ability to grow and keep customers, to generate revenue from those customers, able to stay profitable, maintain dividends and maintain a sound financial structure – with them having a sustainable competitive advantage in Russia as the Telecom leader.